In Mexico almost every child grows up eating Paletas, frozen fruit bars, popsicles made from fresh seasonal fruit. 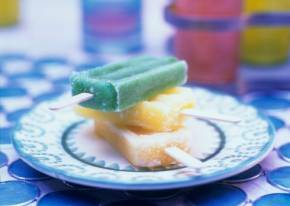 The fruit is sometimes blended with milk or cream to create paletas de leche, or milk Popsicles, and sometimes it's just puréed with sugar. These are known as paletas de agua, or water Popsicles. Traditional popular flavors include watermelon, cantaloupe, lime, strawberry, and chocolate. Part of the allure of paletas over regular American Popsicles is the fresh-fruit flavors. The paletas that contain milk are slightly creamy; the others are icy. Use frozen fruit bar molds (popsicle molds) with a 1/4 to 1/3-cup capacity; they're sold in many cookware and hardware stores and through some cookware catalogs. In a 2-cup glass measure, combine 1 cup milk, 3/4 cup smoothly mashed ripe banana, 1 teaspoon vanilla, and 1/4 cup sugar; stir until sugar is dissolved (mixture is no longer grainy to taste). Per paleta: 85 cal., 16% (14 cal.) from fat; 1.6 g protein; 1.5 g fat (0.9 g sat. ); 17 g carbo (0.5 g fiber); 20 mg sodium; 5.7 mg chol. In a blender, whirl 2 1/2 cups rinsed, drained blackberries until smooth. Push through a strainer into a 2-cup glass measure; discard residue. Add 1 cup milk and 6 tablespoons sugar to berry purée; stir until sugar is dissolved. Per paleta: 104 cal., 13% (14 cal.) from fat; 1.8 g protein; 1.6 g fat (0.8 g sat. ); 22 g carbo (0 g fiber); 20 mg sodium; 5.7 mg chol. In a blender, combine 3 cups 1-inch chunks peeled, seeded cucumber (1 1/2 lb. ); 2/3 cup sugar; 1/3 cup lemon juice; and 1 rinsed, stemmed jalapeño chili (1 to 1 1/2 oz. ; remove seeds and veins for less heat). Whirl until smooth. Push mixture through a fine strainer set over a 2-cup glass measure; discard residue. Per paleta: 100 cal., 0.9% (0.9 cal.) from fat; 0.5 g protein; 0.1 g fat (0 g sat. ); 26 g carbo (0.4 g fiber); 7.5 mg sodium; 0 mg chol. In a blender, combine 2 1/2 cups 1-inch chunks mangoes (from 1 1/2 lb. fruit), 1/4 cup sugar, and 3 tablespoons lime juice; whirl until smooth. Per paleta: 85 cal., 2.1% (1.8 cal.) from fat; 0.4 g protein; 0.2 g fat (0.1 g sat. ); 22 g carbo (0.8 g fiber); 2.9 mg sodium; 0 mg chol. In a blender, combine 1 cup milk, 1/2 cup 1-inch chunks fresh or canned pineapple, 1/3 cup sugar, 1 teaspoon vanilla, and 1/2 teaspoon coconut extract; whirl until smooth. Per paleta: 76 cal., 17% (13 cal.) from fat; 1.4 g protein; 1.4 g fat (0.8 g sat. ); 15 g carbo (0.2 g fiber); 20 mg sodium; 5.7 mg chol. In a 2-cup glass measure, combine 1 1/3 cups orange juice, 1/3 cup lime juice, and 1/4 cup sugar; stir until sugar is dissolved. Per paleta: 60 cal., 1.5% (0.9 cal.) from fat; 0.4 g protein; 0.1 g fat (0 g sat. ); 15 g carbo (0.1 g fiber); 2.8 mg sodium; 0 mg chol. In a blender, whirl 3 3/4 cups rinsed, hulled strawberries until smooth. Push through a fine strainer into a 2-cup glass measure; discard residue. Add 1/3 cup sugar and 1 tablespoon lemon juice to berry purée; stir until sugar is dissolved. Per paleta: 72 cal., 5% (3.6 cal.) from fat; 0.6 g protein; 0.4 g fat (0 g sat. ); 18 g carbo (2.5 g fiber); 1.6 mg sodium; 0 mg chol. 1. Pour paletas mixture (see choices above) equally into 6 juice bar molds. Attach covers. Insert sticks, leaving 1 1/2 to 2 inches of each exposed. Freeze paletas upright until firm, at least 3 hours or up to 2 weeks. 2. Hold each mold up to the rim under warm running water just until paletas are released from sides of molds, 5 to 15 seconds. Remove covers and pull out paletas. Eat immediately or store in freezer. My Gram made these for us as kids... The Cucumber ones are my FAV!! delisioso!!!!!! simple,fun, a kid can do...love it. . . try it! they were really good! and i hope i get an "A" on my project! Really good recipe. Thank you for the recipe. Perfect treat for a hot day! I love Paletas, they are absolutely fantabulous. I'm not of the Latin Nation but I love Paletas. These are wonderful. I love the cucumber/chili ones the best! They are the subject of a blog I did. I linked to you. Have made ... 1. Banana, 2. Cantalope, 3. papaya, 4. pina-colada. 5. limonade, 6. mango. Must keep experimenting more! I made a double mix of "Pina-Colada" pops and they were "to die for"! All loved them! Made another batch just like the recipe called for, yet, it tasted different! MUST have made a mistake in first batch! Now I can't duplicate it ! I made a variation with Guanabana and it was excellent. My family really enjoyed it.